Introducing the Fendi Lei Selleria Bag. This newest bag from the Fendi Selleria line is made of Cuoio Romano leather. A Boston bag, the Lei is hand-stitched and features a top handle with an adjustable and removable shoulder strap. It has a macro zip with double zipper pull. The interior includes a zip pocket and two flat pocket. The bag has the Silver Selleria plaque with an engraved serial number. The Lei is a sophisticated casual bag, perfect to use everyday. 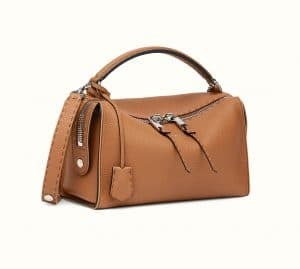 We know most women wish that there will be more signature bags out there that are not too feminine or too girly because they are neither one. A bag that is neither sexist but is completely androgynous is a dream bag to many but that dream is no longer such as Fendi heard your pleas with this Lei Selleria Bag. Beautifully and lovingly handcrafted in Italy, the Lei Selleria bag is a perfection in real life. Made from the most genuine Toffee Roman leather, this Boston bag with hand-sewn stitches and hot-stamped logo is sure to make your day. 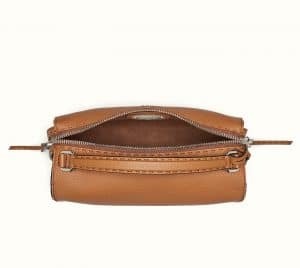 It has the following features: macro zip with double zipper pull and lining with zip pocket and two flat pockets, has Selleria plaque with engraved serial number. It also comes in three different colors: Toffee, Asphalt gray, and milk white. 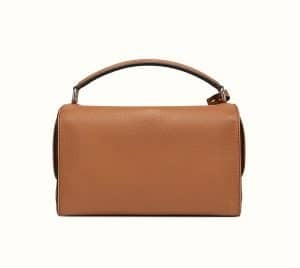 This bag is effortlessly stylish without trying too much thus it will definitely be loved by many. Simple, understated yet snazzy nonetheless, the Lei Selleri will be the next big hit among bag lovers. It has the following dimensions: 30 x 17 x 13 cm (Lx H x D) and comes with a steep price of $2700 USD. So come now beautiful, make this Fendi bag your newest fashion investment.